Arches National Park is located in East Central Utah, near the town of Moab, UT. Most of the exposed rock in the park are salmon colored Entrada Sandstone (where most of the arches form) and lighter colored Navajo Sandstone. Over time, water and ice forms in the fissures between the two layers As the water freezes, it expands, chipping bits of rock away. As this rock falls or is blown away, a hole forms. Eventually, larger chunks start falling off and you get an arch. The weathering never stops, and after a long time, these arches will collapse, even as new ones are formed. I was at Arches several days, so I have a lot of good photos. Too many to put on one page, so I have split them out. Delicate Arch. This is probably the most recognized arche. It is also the one on Utah's license plate. 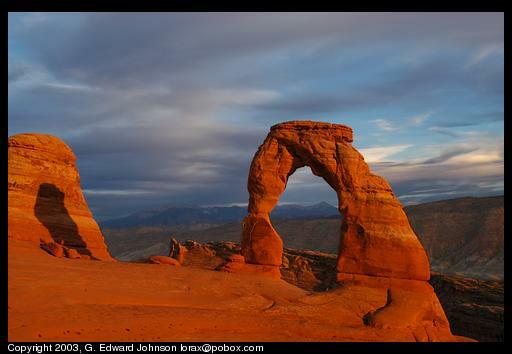 There are two places to see it, first, at Delicate Arch viewpoint. This is a short, fairly easy hike, but you don't get very close to the arch. The other way is to take a 1.5 mile hike over slick rock. This lets you get right up to the base of the arch. Sunset is the best time to hike to the arch. When I was there there were at least 50 people along the rocks watching the sunset and taking pictures. Arches. There are thousands of arches in the park, here are pictures of some of them. Non-arches. There is more to the park than just the arches. There are also large rock monoliths, rock fins, a balanced rock, and great sunsets.